The Galaxy’s Awesomest Music App! Instantly create hundreds of unique grooves with Melody Star! Arrange them in any combination you want. A fun way to express your musical talent! Learn more about Melody Star FREE for iPhone, iPad and iPod Touch. 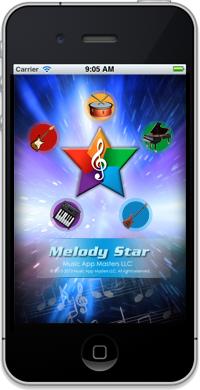 Melody Star Version 4.0 (Freemium) and Melody Star Premium were released with upgrades and new features on 10-12-13. All of the Version 4.0 upgrades listed above are included. Melody Star Premium 2.0 comes with all 50 sounds–10 on each instrument–already loaded, and with no ads, bundled into one low-priced purchase, but for a limited time!